As an active, long-term investor, Greencoat UK Wind has an ambitious acquisition strategy and continues to acquire windfarms across the British Isles. The company has a growing portfolio of assets with windfarms of differing sizes varying from six megawatts of output from the smallest to hundreds of megawatts from the largest. The company prides itself on being very knowledgeable about the market. Greencoat uses a defined framework for new acquisitions and this involves getting a specialist service provider to perform a telecoms audit. The purpose is to ensure that Greencoat and its customers such as Northern Ireland Electricity and SONI have full visibility over its windfarm assets in the field. This discovery exercise typically involves assessing the current telecoms infrastructure and upgrading or reconfiguring it to ensure high speed, robust connectivity. Greencoat also looks to layer a montoring and alerting service on top so that downtime can be immediately identified and remedial action taken to bring assets back online. A separate discovery exercise is performed by EMR at each windfarm, which yields a detailed report on how the telecoms infrastructure needs to be upgraded and/or configured to ensure reliable, robust communications. Specialist EMR engineers deploy the required hardware and configure best-in-class firewalls to secure network traffic and enable remote access. 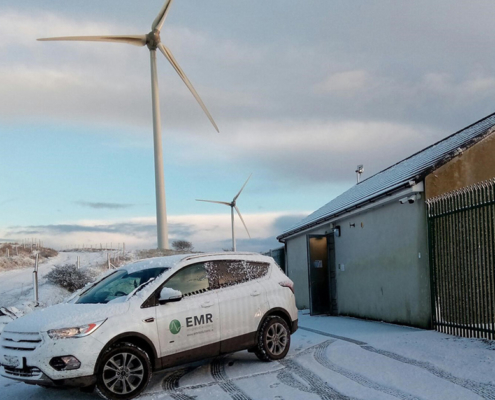 Where required, the EMR team provide a full managed service ensuring that the SCADA system of electricity transmission operators such as SONI can see Greencoat’s windfarms on the grid. Telecoms outages are immediately identified by the EMR helpdesk and flagged to the relevant operators. Maximum uptime lies at the core of the service. Liaison with Greencoat’s customers to ensure presence on the transmission grid. Greencoat UK Wind is an asset management company with no IT or telecoms expertise. Its operating success is built on establishing a network of trusted technology partners that it works with to render its assets market-ready. In choosing such partners, Mr Serrano expects them to work independently of him by drawing on their industry knowledge and liasing with Greencoat’s other service providers where required. Completing projects on time and on budget is a given. And that’s exactly what the EMR team deliver, time and time again. Greencoat UK Wind invests in operating UK wind farms to provide shareholders with a sustainable and transparent income stream. The company is invested solely in operating onshore and offshore UK wind farms which are currently producing income. Greencoat UK Wind was the first renewable infrastructure fund to list on the LSE main market and is the only infrastructure fund or renewable infrastructure fund domiciled in the UK. The Company is a constituent of the FTSE-250 index. Greencoat UK Wind is incorporated in England and Wales, and is a UK Investment Trust. The Company is managed by an experienced team of senior executives from Greencoat Capital LLP, a leading European renewable investment manager, and overseen by a strong and experienced independent board of directors, all of whom are based in the UK. Greencoat UK Wind has a broad investor base that includes numerous blue-chip institutional investors.